"We ensure your new office has adequate network and phone points to facilitate your staff whilst keeping the cables neatly concealed in modern products such as dado and skirting trunking." BCS manage the installation and containment of your data and network cabling. This ensures that your electrical infrastructure is functional, safe and designed to complement your working environment. Whether it is part of a new build or refurbishment programme, BCS Electrics ensure you have adequate network and phone points to keep your business busy and customers happy. Not only do we design the network cabling infrastructure based on usage but we work hard to ensure cables are hidden through containment such as dado and skirting trunking so they fit in with their environment. From historical buildings to hospital wards, we neatly confine cabling so it blends in perfectly with interior walls and floors. Computer and telephone cables, equipment and wall sockets are cleverly connected with nothing exposed. 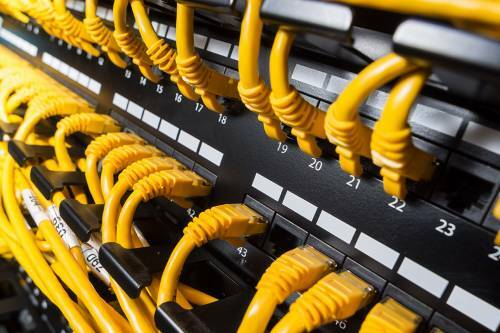 If you would like a quote for data network cabling and containment or for advice on the best way to network your building, get in touch with BCS Electrics on 0113 235 0400. Since BCS Electrics formed in 1946, we have maintained our service traditions combined with up to date techniques and energy efficient products. We provide each and every one of our clients with exceptional service from fully qualified engineers. We work in line with the very latest Health & Safety legislation and make it our mission to keep our clients compliant and their premises safe to work in.